Ever struggle to come up with new and healthy lunch ideas? Want to pack something for the kids or yourself and not have to make separate lunches? I think this Waffled Veggie Meal Prep Idea tackles all of those dilemmas. This lunch is loaded with tons of healthy fruits and veggies.It also incorporates an allergy friendly popcorn, SKINNYPOP POPCORN. 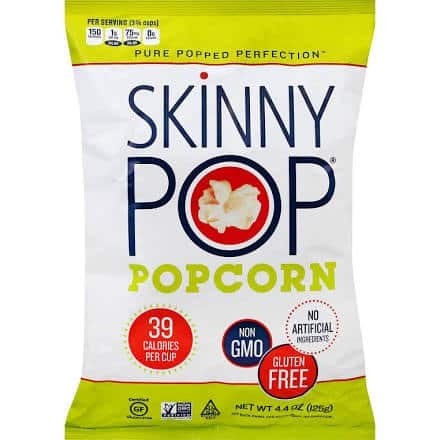 As a mom with food sensitivities and babes with severe food allergies I am very excited to share my love for SKINNYPOP POPCORN and their mission. SKINNYPOP POPCORN is helping to offer a safe option for snacking by being mindful of some of the most common allergens. Now for those waffled veggie patties…They are fantastic, even my kiddos went bananas over how yummy they were. Waffling veggies has become a super power that I have obtained as a parent. It’s a passion of mine to find new and exciting ways to incorporate healthy veggies into any meal. I never want to be the parent that needs to forces my kids to eat their broccoli. Instead I want to find new and exciting ways we both can enjoy eating them. These waffled veggies are a definite keeper that you will want to make again and again. Add a dollop of sour cream or Greek yogurt to the side depending on your personal preference. Try them for your next breakfast, lunch, dinner or a snack!